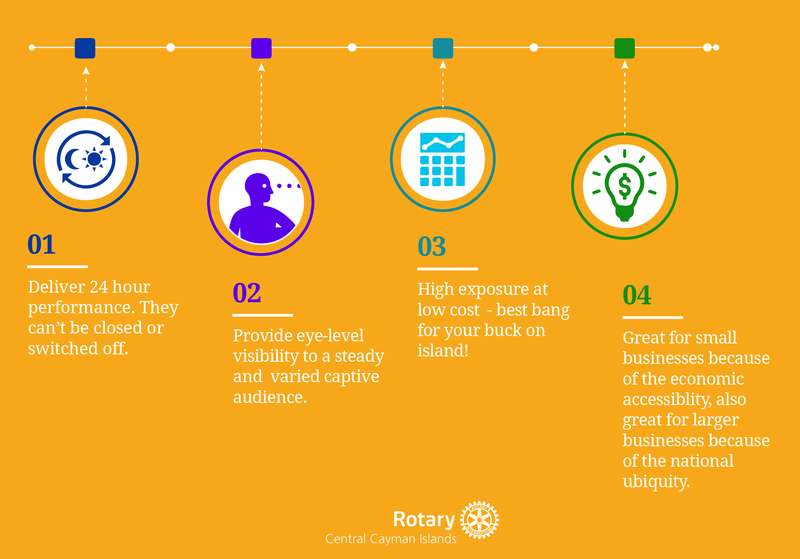 Rotary has constructed and placed over 80 bus shelters throughout Grand Cayman. Every shelter has a total of 4 possible advertising spots to choose from. A select few have an addtional panel in the back for available as well. Each advertising spot can be booked for 6 a minmum of 6 months at a time. New spots are coming available every day. The map above shows all of the shelters throughout the island. By clicking on a particular shelter, can find in-depth information about that shelter like driving directions and cross streets as well as the availability of it’s panels. Once you’ve found a shelter in the area you need, and have isolated a panel that’s available you can contact our Shelter committee to get started with reserving that spot of your business. For our full terms and conditions and to request a quote for a specific location or set of locations, please enter your email address below. You’ll automatically receive our booking form.